Welcome to a very special Antiwar Comic. 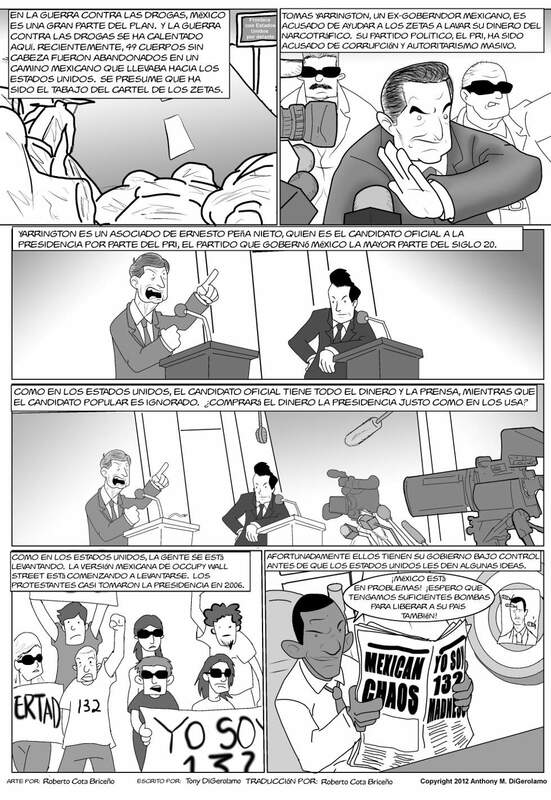 Today’s strip features a piece about the state of the Drug War and the current politics in Mexico. (Special thanks to Roberto for helping me out on this one.) For our friends south of the border, today’s strip also comes with the Spanish translation below. Haga clic en la imagen de la versión en español. The Antiwar Comic: Know Your Deployments! In the second panel I think that “andauthoritarism” should be two words. Fixed. Yeah, I thought about that line. But I came to the conclusion, like bullets, bombs are just ammo. And just like the bullets in this war, there will probably be a shortage because they are shooting so many. Weird. I got that from the article I read. Two ways of spelling perhaps? I just did a Googlefight between the two, and with 361 000 vs 1630 I would bet that the article just had it spelled wrong. It happens.